Stop Blaming Artists and Musicians for the Ghost Ship Fire. Blame People In Power Who Screwed Up. I finally lost it when a young woman, the partner of Ghost Ship fire victim Em Bohlka, spoke on Monday night. “I loved her so much, and I will never stop telling her story,” she avowed of the 33-year-old transgender poet, photographer, and Oaklander, while in front of thousands at Lake Merritt. It was a windless night, the water motionless, faces in the crowd softly lit with vigil candles. Sobbing overtook the lakeside pergola. And I bawled with everyone. It was devastating. But that’s not what I want to focus on today: Now, I want to keep it real about the imminent witch hunt against Oakland’s arts and music underground scene. In fact, it’s not even looming. The blaming of the tens-of-thousands of low-income creatives living in unconventional domiciles throughout the East Bay is already happening. And traditional-media outlets that have published shameful editorializing on how officials must crack down immediately on furtive artists and their presumably illegal, purportedly dangerous live-work spaces. This divisive blaming isn’t a way to respond to Friday’s fire. 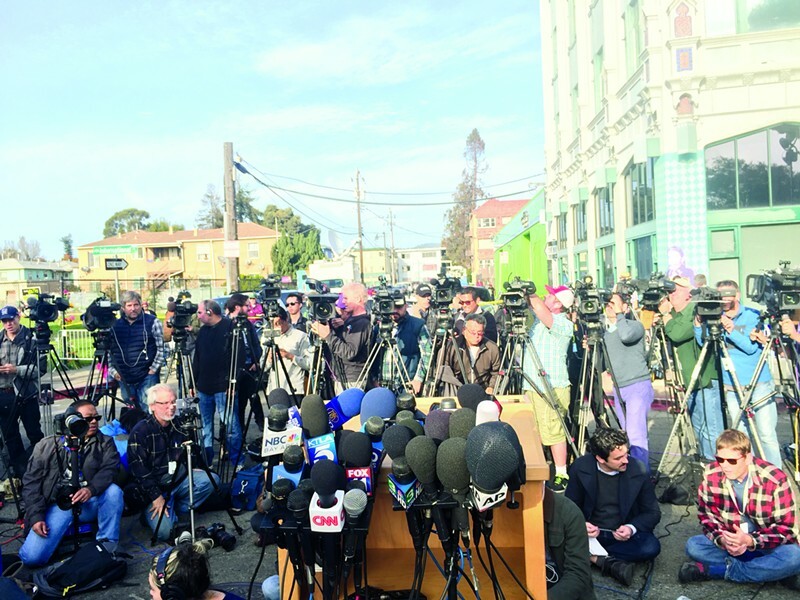 Evicting the very community that was harmed by the Ghost Ship incident won’t prevent further tragedy. And the East Bay’s arts-and-music counterculture scene is not the bad guy. It’s the victim. In the coming months, the Express will be a watchdog to make sure that government officials, business owners, and the region’s leaders don’t put the underground scene in the crosshairs. Many artists living in these warehouse-style spaces are already housing-insecure — let’s not jerk the bottom out from under them. Instead, we’re going to project some serious sunshine on the powerful — the people whose screw-ups led to the 36 deaths on Friday night. Specifically, I’m talking about underfunded government agencies, and the myopic elected officials that ignored these department’s needs. And let’s not forget negligent landlords — throw a rock, you’ll hit one. Or the outlier, bad-actor art-scene figureheads — you’re on watch. This is how the Express will appropriate its investigative and news-gathering resources: by going after those with power. We also promise to respect a community that is recovering, and give people space to grieve and heal after this full-on, international-media blitz. There’s been some tremendous, crucial journalism in the recent days — but an equal amount of chew-’em-up-and-spit-’em-out, bleeds-it-leads news. It’s time for calm. It’s time to care for each other.